Sifting through old Texas newspapers, I found the first mention of commercial smoked meat from the Brenham Weekly Banner, which announced that a Bastrop butcher "keeps on hand at his stall a ready stock of barbecued meats and cooked sausages." As is true throughout the South, the public barbecue was commonplace in Texas long before there were any restaurants serving commercial barbecue. As soon as a little town had enough population to consume a whole steer, the Fourth of July celebrations at the center of town or the political rallies on the courthouse steps became popular venues for open pit cooking. But we’ll get to those communal gatherings in a future column. Today our focus is the first wave of commercial joints that were inspired by those giant cookouts. The Texas barbecue boom—the original one at least—came in the decades after the Civil War. During this time the economy was in shambles throughout the South, including Texas, but the one thing we still had here was beef. A lot of it. And butcher shops sprouted up in towns all over the state. The University of North Texas hosts an impressive collection of old Texas newspapers, and I’ve been combing through them in recent weeks, looking for early mentions of barbecue and studying how the journalists of the day regarded the stuff. (You can do the same; UNT’s collection is mostly online and available through the Portal of Texas History.) I’ve focused on this collection because it is the broadest that I could find that is searchable by keyword, including more than 40,000 Texas newspapers covering the latter half of the nineteenth century. What I’ve found is that Texans have been gathering around wood-cooked meat for about as long as we’ve had newspapers. The first mention of commercial smoked meat in the UNT collection is from the October 25, 1878 edition of the Brenham Weekly Banner: “A Bastrop butcher keeps on hand at his stall a ready stock of barbecued meats and cooked sausages.” There is no other context given about the location or the proprietor, but it’s certainly a butcher in Central Texas. It may have been one of the two rival butchers in Bastrop that began advertising barbecued meats eight years later. In August of 1886 it was Bastrop’s Alexander & Gill who were promoting barbecued meats at their new market. Two months later John Kohler ran a similar ad. The following week Alexander & Gill had hot coffee on the menu. John Kohler followed suit with hot coffee of his own the week after. The meats that were barbecued weren’t specified in either case. In 1885 Kemper Bros. & Robinson Meat Market offered smoked sausages in Fort Worth. Ten years earlier the Dallas Daily Herald joked about sending the city’s excess dogs to a German sausage factory that had just opened in Austin, but nothing specific was provided about the factory. I’m not sure if the joke was meant for the Germans or their sausage. Probably both. The following year those Elgin hot guts would get a proper storefront when Southside Market, the oldest barbecue joint in Texas, opened in 1886. In these old papers there are enough references to barbecue and wood-burning pits to make the general definition of barbecue obvious, but sometimes those definitions got skewed just as they do today. If Twitter had existed in 1888, the barbecue purists of today would have taken to it in droves to mock the Mineola Monitor for a “Barbecued Pork” recipe the paper published that year. The instructions call for baking the pork for three hours then topping with a mix of “catchup [sic] and cider.” To be fair, the town of Mineola was allegedly named by Ira Hobart Evans, who hailed from New Hampshire. In the same year, the editor for the San Marcos Free Press was an early advocate for more barbecue options. Growing tired of waiting until a big public event to enjoy his barbecued meats he wrote “That was a happy thought of one of our butchers, since adopted by the rest, to furnish our people barbecued meats…‘Tis, in fact, the only way meats should be cooked…” He then gave credit to Mr. Sitman for being the butcher to start it all in San Marcos. Later that year another butcher started advertising “Fresh Barbecued Meats” in Waco. His name was J. J. Riddle. When I first came across the J. J. Riddle ad I posted it on Twitter. Trey Moran, who tweets as @TexasFoodMyWay saw it and immediately started searching genealogy websites. Before long he emailed me the contact information for Johanna Riddle. She had married into the Riddle family but had researched the life of James Julius (J. J.) Riddle extensively. She shared all she had and we were able to piece together his connection to the early days of Texas barbecue. The Riddle family would eventually be responsible for the first documented commercial barbecue establishment in Waco. But let’s back up a little. The namesake of the James Julius Riddle that opened that joint was his grandfather, Dr. Elder James Julius “J. J.” Riddle. He was born in Alabama in 1821 to a family of third generation Americans of Scottish descent, and lived there until his marriage to a woman named Margaret in 1847, after which the family moved to Mississippi. There they had a son Alva Curtis “Curt” Riddle in 1849. Shortly after Curt was born the family made their way to Texas. They settled in Waco, along with their slaves, in 1852, and began to grow cotton on the west side of the Brazos River. Today, there is still a Riddle Street on that side of Waco. At the start of the Civil War, James Julius, now an ordained Baptist minister, enlisted as a chaplain. He spent most of the war in Kentucky and Tennessee. When he retuned to Texas, the state was in economic ruin. His own cotton business had fallen apart too. Without slaves to operate it, the farm was no longer viable, so he focused on preaching. In 1874, Riddle’s son, Curt, decided to strike out on his own. He opened a meat market on Eighth St. in Waco, just a few blocks off of the still bustling branch of the Chisholm Trail that ran through the town square and across the newly completed suspension bridge. It was a good location, but by 1888, Curt Riddle’s reputation had grown enough for him to move to an even better spot, a building on Austin Ave. previously inhabited by Mike Hennesy’s meat market. This location was right on the Chisolm Trail. Three years earlier Hennesy had caused a local stir with a marketing stunt where cattle, led by a full brass band were paraded through town and back into his shop to be slaughtered just in time for Christmas of 1885. 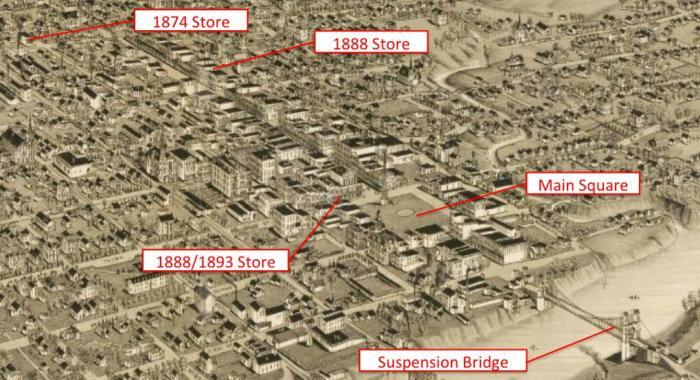 An aerial map courtesy of the Amon Carter Museum’s website showing Waco in 1886. Curt Riddle’s various store locations are marked. After just nine months the store was moved yet again, to Waco’s town square. This restaurant, at 208 South Square, became Waco’s first documented commercial barbecue joint. It was known as J.J. Riddle’s Cash Market. On September 7, 1888, the Waco Evening News announced that, “Mr. Jimmie Riddle will open up a first-class meat market in the morning with Mr. Kirt [sic] Riddle, the prince of Waco butchers, behind the meat block.” The Jimmie Riddle mentioned here must have been Curt’s son, who Curt named after his father James Julius, who had passed away in 1881. Jimmie was only fourteen, but he was already a partner in the business that was named after him. Thanks to Curt’s local popularity, business was good on their opening weekend as they “sold two whole beefs to the last piece.” Brisket was a nickel per pound. Just two weeks later, a newspaper ad appeared announcing “A New Departure” for the market. “Fresh Barbecued Meats. Every day direct from the kiln, and delivered to your residence.” Barbecue delivery was now available in downtown Waco. The advertisements continued to pop up, and business was presumably humming along for the next several years until a lawsuit was brought against the store. T. M. Walker was a “prominent South Texas cattle man” from Gonzales. He brought suit against Curt Riddle for $24,900, alleging non-payment for cattle. It took twenty months for Walker to win the case in November of 1893. The Riddles owed him $325. Unfazed by the lawsuit, the father and son team had already moved next door to 220 South Square to a new market that included a “very fine pit for barbecueing all kinds of meat.” Newspaper advertisements for the business continued until December of 1893. I couldn’t find another mention of the men or their business after that point, but they may have sealed their fate by moving. The Rack & Clowe Meat Market moved into the Riddle’s old address. On April 10, 1893 an ad appeared for Rack & Clowe in the Waco Evening News for “Hot Barbecue Meat. Best Meats in the Market.” The Riddle’s had some competition. Curt died twenty years later and his son J. J. died in 1940. They are both buried in Waco, but their gravestones don’t mention their status as the originators of the Waco barbecue scene. It must be said that this is not to be considered empirical evidence of the origins of Texas barbecue, or even barbecue in Waco. This is a snapshot of history from a limited collection of resources, but it provides us with evidence of the oft-repeated claim that Central Texas barbecue that was sold commercially originated in butcher shops. In this case it was from a fifth generation American of Scottish decent instead of a Czech or German immigrant.